The 2012 version of Samsung's Smart Hub Web platform offers a redesigned user interface and a variety of new services, depending on the TV model. This is a review of the premium version of Smart Hub 2012, as offered on top-shelf Samsung TVs like the ES8000/ES7500 LED line and PNE8000 plasma line that include a built-in camera. As with previous versions of the platform, Smart Hub 2012 includes access to popular services like Netflix, VUDU, Hulu Plus, Pandora, CinemaNow, Facebook, YouTube, and MLB.TV. Skype is also available, and the built-in camera made video conferencing a breeze (on lower-end Smart TV models, you can add a camera via the USB port). You can browse and add new services via the Samsung Apps store, from categories like videos, games, sports, education, and more. Some apps are free, while others cost a fee to purchase. • Read more about this topic in our Streaming, Apps, and Downloads News section. 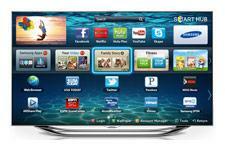 • Explore reviews of LED HDTVs and Plasma HDTVs. • See related information in our Media Server Review section. The Smart Hub onscreen interface is clean and easy to navigate. Your video source will continue to play in a small window in the upper left corner while you browse Smart Hub; I wish the window were a little bigger, but that's just my personal preference. In order to download new apps and participate in many of the services, you first need to create a Smart Hub account, which will be linked to a general Samsung.com account. Each person in the house can create a different account and then customize the Smart Hub interface with their own wallpaper and apps arrangement. Certain premium apps are locked in place and can't be moved, but secondary apps that run along the bottom half of the screen can be rearranged or deleted. The built-in camera allows each user to sign in via facial recognition, if desired. If you've used any Web platform from any manufacturer, then you're likely familiar with the general functionality of apps like Netflix, VUDU, Hulu Plus, and the like. I'm going to concentrate on a few Samsung-specific services that have been added this year. The first one is called Your Video, the place to begin a search for video-on-demand content. Browse popular titles or search for a specific title, and Your Video will show you which VOD provider currently offers that title, how much it costs to rent/buy, director/cast info, and more. For instance, I clicked on "We Bought a Zoo" from the Your Video list of Top 20 Movies and was informed that both VUDU and CinemaNow offer it. With a click of a button, I was taken directly to the desired app without having to manually exit Your Video and navigate to the other app. This is a great feature that is well implemented. The new marquee Smart Interaction apps are called Family Story, Fitness, and Kids. The Fitness app allows you to access a variety of free exercise videos, create a profile, track your progress, and even attach a USB scale. Using the built-in camera and Virtual Mirror tool, you can see a live feed split-screen with the exercise video to check out your form (or lack thereof). The Kids section offers an assortment of kid-friendly activities, including interactive stories and a sticker book where your children can show off stickers they've earned through various activities. As the mother of a three-year-old, I was intrigued by the Kids area but found myself underwhelmed by its implementation in these early-goings. The story collection doesn't currently include any popular titles; it consists mostly of short education tools to help develop your child's reading skills. That's fine, but the titles are slow to load and very awkward to navigate. The idea has potential, but I found it easier, faster, and more intuitive for my daughter to access similar content on my iPhone or Samsung tablet. Perhaps slightly older children who can work the TV remote on their own would have more fun with this service. Finally, there's Family Story, which is basically a private social network in which you and your family/friends can share photos, events, and memos. You can create, join, and participate in a group directly through the Family Story app on your Smart Hub TV or by creating an account at www.familystory.com. You can upload photos via the TV's USB port or a DLNA-attached server (I had no trouble going the USB route, but the TV never saw my PLEX/DLNA server), and you can write memos or create events directly through the TV's Family Story interface; however, I found it much easier to do the heavy uploading/typing via Familystory.com on my computer and then use the TV app as a viewing portal. Family Story includes a "Watch Together Now" function that allows multiple people in the group to view photos simultaneously, but I was unable to get this function to work properly: When I selected the "Watch Together Now" option and highlighted the person I wanted to watch the photo with, nothing happened (said person was using the website interface, so perhaps it only works with people who are both using the TV interface). Beyond the three new Smart Interaction services, Smart Hub 2012 also offers the Social TV app, in which you can view and add comments to your Facebook, Twitter, and/or Google Talk feeds while you watch live TV. The feed runs down right side of screen while your source plays on the left. The Smart Hub Web browser supports Flash and HTML 5, and it loads content fairly quickly. As with other TV-based Web browsers, navigation is a bit clunky and takes some getting used to. The top-shelf TVs have built-in Bluetooth and come with a Bluetooth-based Smart Touch remote that proved to be a better choice than the IR remote or iPhone control app for navigating the Web browser, thanks to its touchpad operation. (I did not have a wireless keyboard/mouse on hand to test, but I suspect that would be a good control option, too.) You can increase the speed of the onscreen pointer and zoom in on Web pages to increase the font size, two tweaks that I found to be very helpful. Smart Hub 2012 also includes Samsung's AllShare Play function to stream content from a computer, tablet, or DLNA media server. I had no trouble sharing content between this TV and a Samsung tablet with the Allshare Play app loaded on it; I could even cue up the content through the tablet and send playback to the TV. I was also able to stream content from my Mac's PLEX/DLNA media server software using the AllShare interface. Samsung's Smart Search tool allows you to search for content across platforms, including connected USB/DLNA devices, YouTube, and the different VOD providers. I typed in "Thor" and got a long list of YouTube clips, Facebook pages, a link to search via the Web, and a link to the different VOD options within Your Video. Of course, to utilize all of the Smart Hub features described above, you have to connect your Samsung TV to a broadband network. The top-shelf TVs offer both wired LAN and built-in WiFi (with WPS for an easy connection). These TVs also support WiFi Direct, so you have the option to link compatible mobile devices directly to the TV without going through a router. If your mobile devices do not support WiFi Direct, you can link them to the TV using the TV's "Soft AP" mode. Read about the High Points, Low Points and Conclusion on Page 2 . . .